So I just created a new blog or more or less reactivated my old technology blog. It is about all the lower level technical stuff such as things about Plone, Python and Zope. 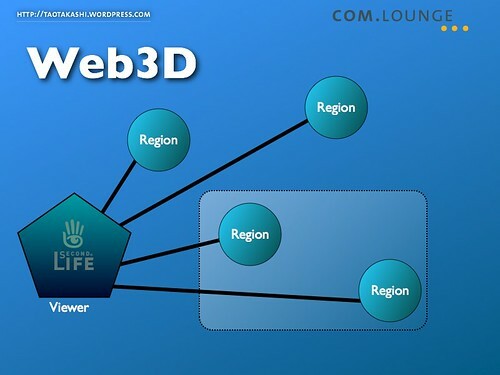 It will definitely also cover some Second Life related stuff in this area, esp. if the SLGA gets going. Speaking of the SLGA: Zero Linden just presented us the goal of Studio Icehouse (which he is leading) for Q4 and number 3) of this was actually getting a viewer authentication running on a demonstration grid with an agent domain. Yay! You will also find a lot of material from the Plone Conference there right now. Esp. useful for me is what I just posted. 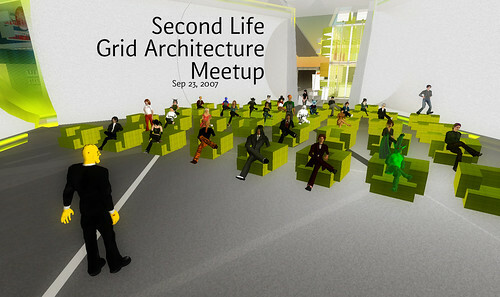 Second Life Grid Architecture Meetup Transcript. So here is the transcript of the session yesterday, I hope everybody is ok with that, if not, please tell me and I will remove your parts. You can find the slides in this flickr set. You: you search for a book in a 2d page and can then jump into a conversation like here about the author etc. Lem Skall: Tao, will the definition of “region” stay the same? You: on your laptop when you are travelling (although in 5-10 years maybe there is no place without internet anymore anyway). You: apparently it simulates all the other avatars around you, the objects etc. Tara5 Oh: i never crashed much up until this last week? You: like name, profile, inventory etc. Fleep Tuque: Agent = avatar, I assume, but would also include bots? Oliver Gassner: does the agent also run on a separateand might it be we have free agents who run slowly and #special’ dedicated agents that cost? Kiwi Alfa: Saijanai: Bots existed even before the viewer was open sourced, you know. 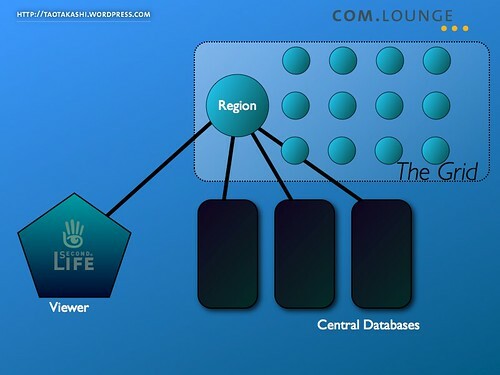 Fleep Tuque: And both the agent domains and region domains are hosted on your own or a remote server? ie not LL? You: so the agent domain consists of some web services which allows to login, to retrieve inventory etc. Jeffronius Batra: Expert, I think that’s separate. Susi Spicoli: why can’t we have all the idle servers help me out when I have an event? Oliver Gassner: so the regions become scalable? Jeffronius Batra: And then separated both logically and physically if desired. Lem Skall: could we connect to the agent without connecting to a region? or connect only to a region but not the agent? Ian Betteridge: What are the implications for the money system? That’s not going to be part of the agent domain, is it? Oliver Gassner: Did I misudnerstand or can the agent run n ym own server? So I have an avatar that I could use in ‘different’ worlds? Miki Gymnast: Tao, whats their mid- or long-term strategy? Island servers, hosted outside LL, agent, search and money servers hosted @ LL? Fleep Tuque: Hm, that’s an interesting concept. one identity with multiple agents. Jeffronius Batra: I think he’s asking if he could run his own agent domain. Oliver Gassner: and I have an avatar on a local machine (agent domain) Can I move ith this avatar (same dataset) in both the company SL and the ‘pulic’ sl? Expert Market: if i host my agent server. what will it manage exactly ? my inventory ? Tara5 Oh: nteresting comparison Try! Oliver Gassner: @Tao: Sure, Identity will matter. Tara5 Oh: iTroy I was doing my hoewrk last night! Tara5 Oh: what do you think will happen to DRM in p2p? Oliver Gassner: so we have what we in German call ‘avatarübergang’? not sutre f the english term. 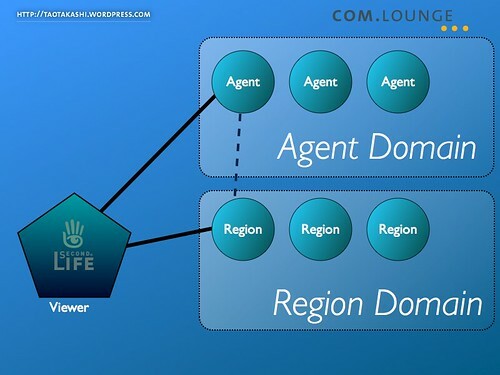 Kiwi Alfa: So, let me get this straight… if the viewer connects to one agent domain, does that mean they would be able to use the same agent throughout any region, regardless of who hosts it? Soft Linden: You may be getting ahead of Tao here. Tao, are you going to show slides with more detail on the agent domain, or may I link the wiki page for it? Lem Skall: so Verisign could become a vendor of trusted agents? Kiwi Alfa: Soft: Sorry, it’s just that I didn’t quite understand what the whole agent/region domain thing was about. I get it now though. Soft Linden: Saijanai: At the bottom, click the category. Lem Skall: Tao, you sure the slide changed? Tillie Ariantho: But with open region, couldn’t someone just ‘copy’ an identity of someone else and then enter the corporate domain? Fleep Tuque: Not if the agent information is separate from the region information? Jeffronius Batra: Tillie, the agent domain would have to trust the caller. Expert Market: write a prokobot. it will prevent anything to exist. You: yes, it will be something with certificates etc. Soft Linden: It is likely agent domains would implement their own security, and that region domains would verify with agent domains that an agent is properly authenticated and in a specific session. Kiwi Alfa: Probably the best method would be to use some sort of private/public key mechanism. Jeffronius Batra: Great, then no one will ever be able to configure it or to log in. Instant perfect security. Oliver Gassner: what would be a time frame for this? Tillie Ariantho: Sounds like 2+ years for me to implement this… WELL. Lem Skall: Tao, doesn’t that sound like another domain for objects? Soft Linden: I don’t know a time table on this. Scope Cleaver: More latency in the handshake processes? Expert Market: or agent server are hpsting asset ? You: but does somebody have an idea of how to get rid of the scalability issues on assets? Tillie Ariantho: Assets are just information in a database, who does Google does that? They have thousands of servers and it works well, all the time. Lem Skall: how will be meetings announced? 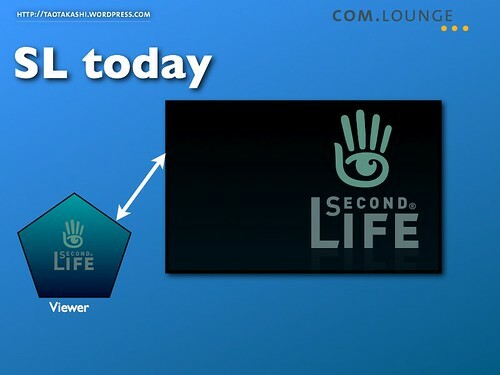 Expert Market: But… i’d LOVE to have some kind of “Second Life proxy”. So i can host on a dedicated server, most of the texture and object i usually see ingame. 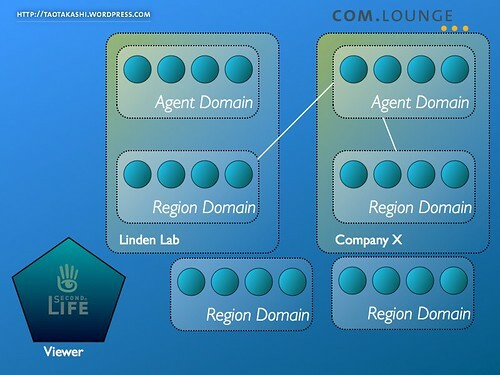 You: and you could have region domains or agent domains for different countries etc. Tillie Ariantho: Yeah, and filters and money transaction checks by country too. I see it coming that you have to connect to your countries login server soon. Expert Market: Tao: not network load, cpu load. when you have everything grey it mean that the DB is feeling gloomy. Lem Skall: how soon object backup? I thought that was going to be soon and isn’t that connected to the new arch? Tara5 Oh: Tao what are the consequencess for DRM in this architecture? You: but of course you should still be able to assign permissions etc. Fleep Torok: DRM is a disaster in every other implementation, I hope they continue to avoid it here too. Dale Glass: Tara5: What exactly do you mean by DRM? Boroondas Gupte: You shouldn’t rez things in regions who’s domain you don’t trust to keep to the permission system, easy as that. Dale Glass: I know what it means, I’m asking what are you referring to in SL. Permissions? Ian Betteridge: But permissions = a DRM system. Tara5 Oh: and how would you see this licensing being agreed apon in time? Ian Betteridge: OK, so let’s be really clear on this: will this architecture preserve the existing system of permissions, which content creators rely on? Tillie Ariantho: Ian: I dont think that will work with open source servers. Expert Market: why not ? Ian Betteridge: Tao: I’ve heard that’s an issue, as you’re not allowed under CC licensing to enforce the license using software. Tillie Ariantho: Yes, trust system is not enough for that. Dale Glass: I talked to people a bit, content creators find the idea of losing permissions scary. I heard a proposal to make it possible to limit assets to a trusted domain. Say, avatars that will not be transferred to non-LL sims. Tillie Ariantho: What works there? Everything is copied and stolen on the good old web. Kiwi Alfa: My feeling is that people running businesses on SL would continue to do so on LL servers, unless they hosted their own. Tillie Ariantho: Yes, but I dont switch the hoster each hour. Tillie Ariantho: What if I create an item and sell it. Someone buys it and is on a server in a ‘not trusted’ domain. The person running the server can grab all the stuff and use it himself. No? As the script are transferred to his server to be run there etc….? You: the other ones are the DB and one is about stateless information such as region name etc. Lem Skall: Tao: so what else besides sims have to be “backwards compatible”? Dale Glass: I sort of like that idea from the POV that an economy is a good thing to have — people who wouldn’t have made stuff otherwise are motivated to make something. Expert Market: any rough ETA for that stuff ? 2y ? 6m ? 5y ? Dale Glass: The problem is, how do you enforce it without going into real DRM of the user’s computer? Ian Betteridge: Would region/agent domain owners be able to turn off specific aspects of LSL? Expert Market: tao: no word about licencing and cost yet ? i suppose ? Fleep Torok: I find it disturbing all this focus on DRM, IP, content sellers.. The point is a flexible, cross-platform architecture that scales, yes? And the issues of economy and IP will vary by region/country/RL geographical law.. separate from the grid architecture. You: also those issues about IP, DRM etc. Soft Linden: Some things like content protection are unsolved problems. sldev is a very good place to float proposals on things that are still abstract. Lem Skall: Tao: how will be meetings announced? Peter Newell must run, thanks for the chat. Savannah Glimmer: Aside from the Dev List, is there a group to join specifically for this? Soft Linden: You can subscribe to sldev and filter it all to the trash, saving only messages with [ann] in the subject to only get announcements. There are other tags as well. Goldie Katsu: Where do I subscribe to sldev? Kiwi Alfa: Well, that too. Expert Market: bleh. mainland is braindead, who care ? Dale Glass: oh yeah, did LL mention how will people connect to the grid when this is done? I mean, I setup a box and then what, pay $X/month for a connection to the grid? Kiwi Alfa: Dale: I imagine that different agennt/region subgrids will ask you to pay for them separately. The whole thing overall probably should be free, but the LL grid, for example, would still cost. Lem Skall: what interest is there in this new architecture from corps like IBM? Fleep Torok: I assume the same as universities and researchers – want to maintain their own assets, backups, etc. Fleep Torok: Our scientists won’t work seriously on the main grid because they can’t control the security and continuity of their research. You: as for confident information etc. Fleep Torok nods at Tara5. Fleep Torok: That’s true indeed, but certain controlled environments and private regions for research are the #1 issue for some of the constituent groups on my campus. Expert Market: i still expect to be usefull as sysadmin… one day, who know ? Soft Linden: There is discussion about getting better streaming from the SF office somewhere near a large screen so RL LL to in-world bridging for meetings shoudl be possible in the future. Saijanai Kuhn: do you contribute to the jira? Do you tweak the wiki? Do you attend office hours? Do you heard cats on sldev? Soft Linden: Not random. Most of these people were engaged in significant projects, or contributed to related discussions in Zero’s office hours, as I look at the list. Goldie Katsu: I have a question on the current open source project – which relates to the grid project. Goldie Katsu: No the client. Goldie Katsu: How are patches being integrated and are they beign folded into the testing harness that tests the client pre-rollout. Kiwi Alfa: For what it’s worth, I’ve been meaning for a long time to attend office hours and Bug Triages, etc, but haven’t been able to yet. Soft Linden: That’s kind of a big unrelated discussion. sldev is a good place for that kind of question, too. Goldie Katsu: The open source integration – and how it is handled has significant impact – and more so when you are talking about parts of the grid. Saijanai Kuhn: I think they’re holding f on really heavy presentations ountil the various houses are in order. Fleep Torok: SLCN.tv would likely do it. Boroondas Gupte: Apropos “outside SL”, will the new architecture help different online VR systems to converge to something compatible? Like interfaces between SL and croquet? You: like an EVE setup, a Google Earth setup etc. Tillie Ariantho: I am missing some details about which linden is doing what in that list. Frans Charming: there is also a google calender of office hours. Soft Linden: Tillie: If you have questions about specific ones, asking on their user talk: page would be one way to get details. Another is to ask on sldev, as chances are the person you ask about will read it. Saijanai Kuhn: I’d rather see that as a plug-in deal. Fleep Torok: Tao, will you post your slides on Slideshare or the equivalent? You: well, there are many things I’d like to have, being able to have optiobnal portals, being able to stack sims on top of each other, having a region which is more like a sphere, like planet etc. Miya Watanabe: I’m taking off. Thank you for the meeting, Tao, and everyone. Ciemaar Flintoff: replace the chat rooms waiting for games to start etc. Saijanai Kuhn: LL is on a mission. Money is secondary in a sense. Fleep Torok: I think the marketplace for virtual worlds is so undefined, there is a lot of incentive to keep your dev to yourself and hope to be THE emergent player. Tara5 Oh: and i think considering whjere the open architecture grid (server based) fits with this p2p No server model would be a very good thing to consider! You: Tara: this might be a question of how to implement regions maybe..
Tillie Ariantho: I don’t like P2P anyway. :p All I see it is used for is breaking laws. Tara5 Oh: and an mixture of server based open archotecture and p2p may well be the way things go? Tillie Ariantho: yes, breaking more laws. Tara5 Oh: well i doubt if there will be much DRM in p2p!!!! Saijanai Kuhn: its actually on the user interface roadmap. Thanks to all the attendees!